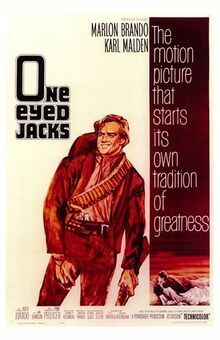 I suspect that if Martin Scorsese and Steven Spielberg hadn't paid for the restoration ONE EYED JACKS wouldn't be playing the New York Film Festival. The only film directed by Marlon Brando its the sort of film where the stories about it are way more interesting than the film itself. Is it any wonder that the resulting film is a bland mess? The plot of the film has Rio aka the Kid (Brando) traveling around with a gang headed by Dad (Karl Malden). When Rio is set up and sent to prison he plots his revenge. Out of prison after five years Rio sets out to get revenge but complications arise when he falls in with the daughter of his avowed enemy. A long slow film it seems more interested in art rather than telling a compelling story. Yea it looks great and yea it's trying to do more than just tell a story of revenge (or whatever) but at the same time it just goes on and on and on. I suppose it would have been better if Brando had made a western (or a film) before but as it stands its just a rambling...mess. I really don't like the film and I think I've only seen it one time straight through. Mostly I'll start the film, figuring it'll be better this time and then somewhere in the first hour I turn it off. Full disclosure I only got twenty minutes into the film when I started watching the film for this piece - my thought being life is too short to be bored for two more hours. Unless you're a fan or you've never seen it and have two and a half hours of your life to waste skip it. Frankly find some pieces about the making of film since they are a hell of a lot more compelling.